What’s your first impression of a Barcelona city map? 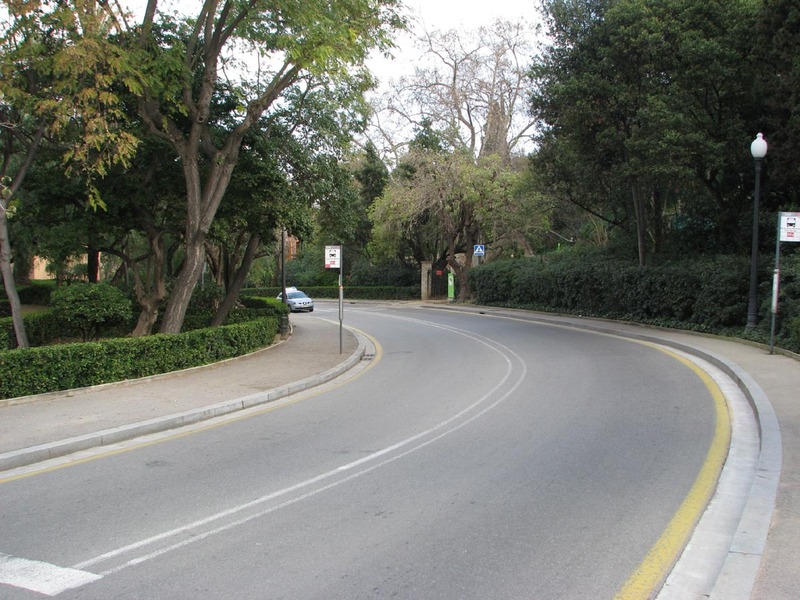 All those perfectly straight roads angled at 90 degrees, forming an intricate rectangular pattern also seen in most US cities and towns with a Roman heritage. 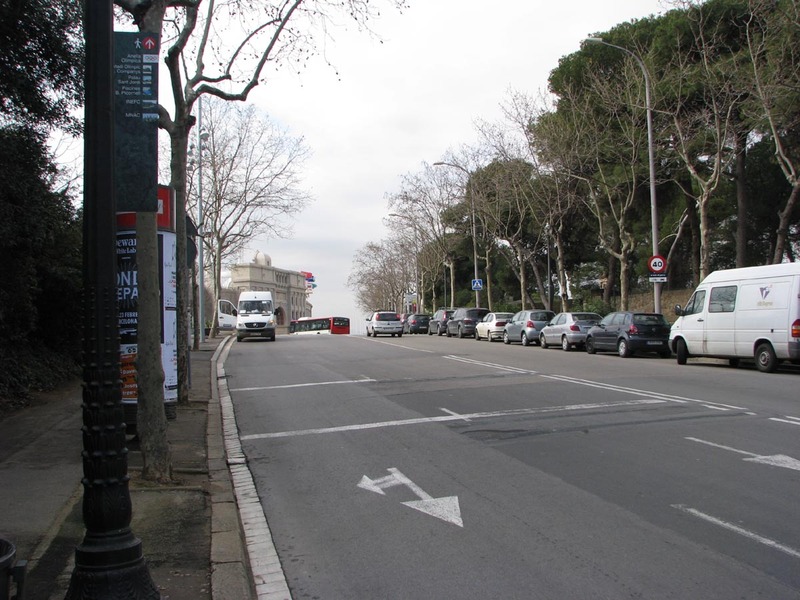 But there is nothing rectangular about the streets of Montjuich (or Montjuïc in Catalan), the wooded parkland and garden-clad hilltop located to the southwest of Barcelona’s city centre. That’s why it’s the ultimate location for a race. 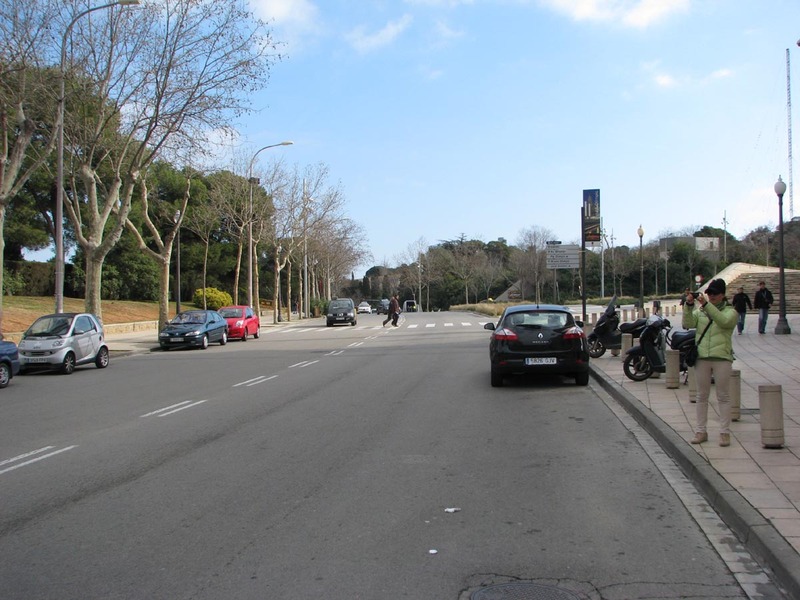 We went there to see what the challenge and the danger of Montjuich Park were all about. 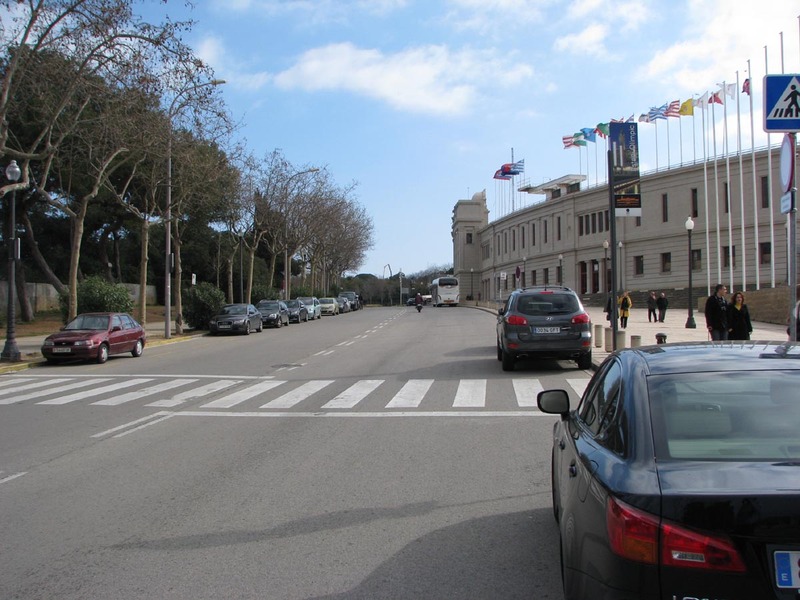 The first Spanish GP with Montjuich as its venue took place as early as 1951. The main event of the weekend was the slowest Grand Prix of the season, when Umberto Masetti took a total of 2 hours, 10 minutes and 56.2 seconds to complete 34 laps at an average speed of 94kph. Never heard of Signor Masetti as a Grand Prix driver? 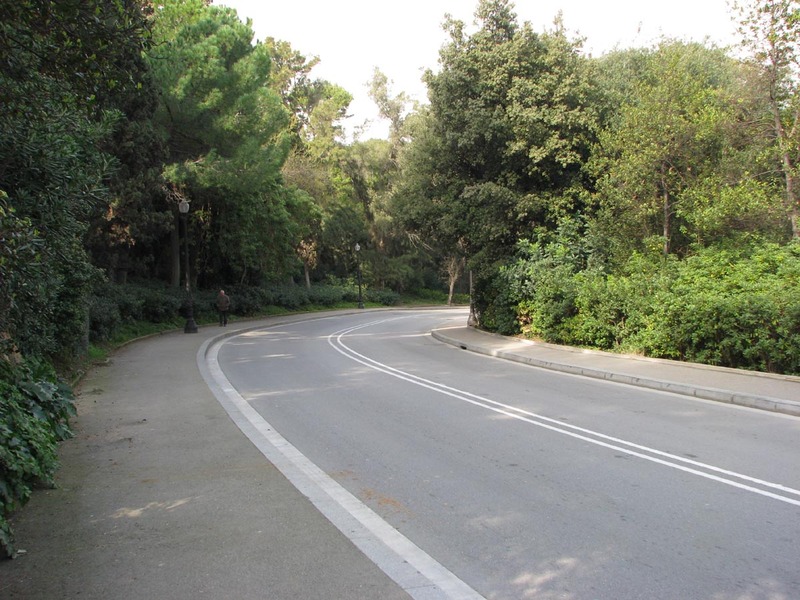 And wasn’t the Spanish GP of 1951 held on the nearby Pedralbes track? Ah yes, that’s because Umberto Masetti was riding a Gilera, that’s why. 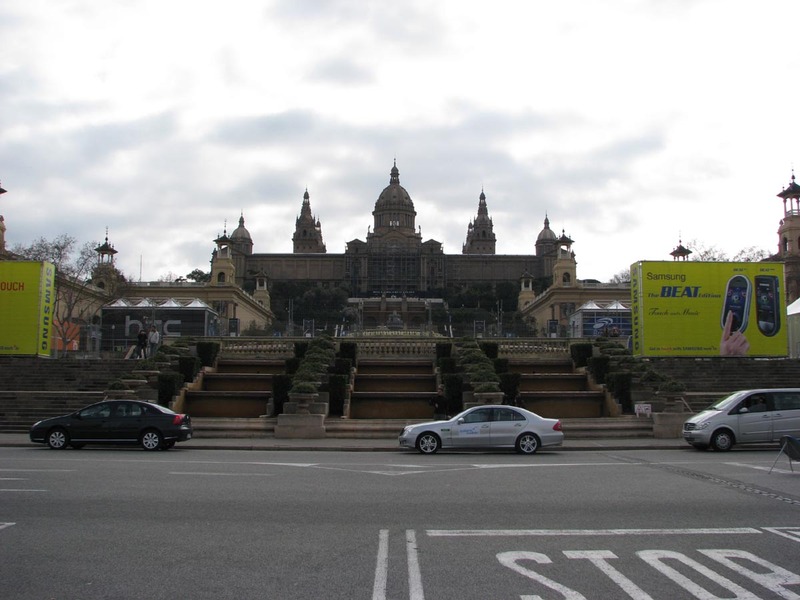 It wasn’t until 1969 that the Spanish GP moved to Montjuich for four-wheeled Grand Prix competition. 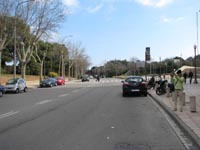 In fact, it’s the same year when the bikes event was first held away from Montjuich Park, as it was moved to the permanent circuit of Jarama, where the F1 race had been staged the year before, making it a straight swap. 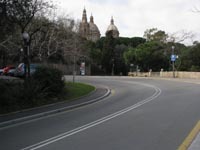 The swapping would continue until 1976 after which Montjuich had finally outlived its presence on both two-wheel and four-wheel Grand Prix calendar – no doubt hastened by the drama of the 1975 Grand Prix when on lap 26 five spectators were killed after the leading Hill of Rolf Stommelen polevaulted the Armco after its rear wing broke off. 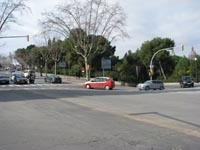 The dangers that had always been present had finally taken their toll, and the event was permanently switched to Jarama. 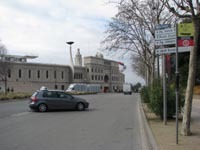 For both events actually, since the MotoGP race also moved to the Madrid track in 1977. 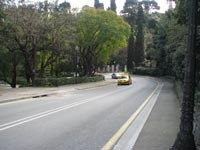 Still, drivers raved about the challenge, while the circuit’s surroundings were as pleasant to the eye as those at Monaco, and equally glamorous as well. 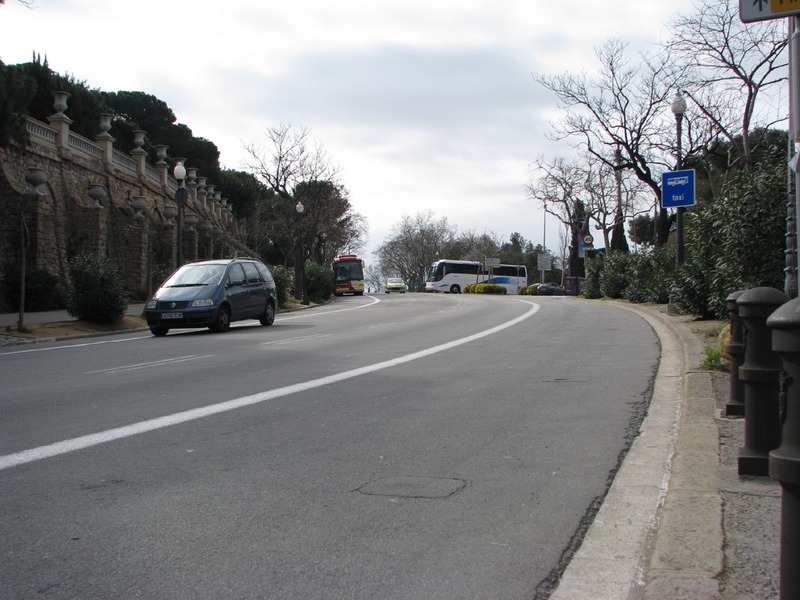 It’s unsurprising that the circuit’s origins stem from the same period Anthony Nogues put the city of Monte Carlo into the limelight as the backdrop for a car race of international repute. 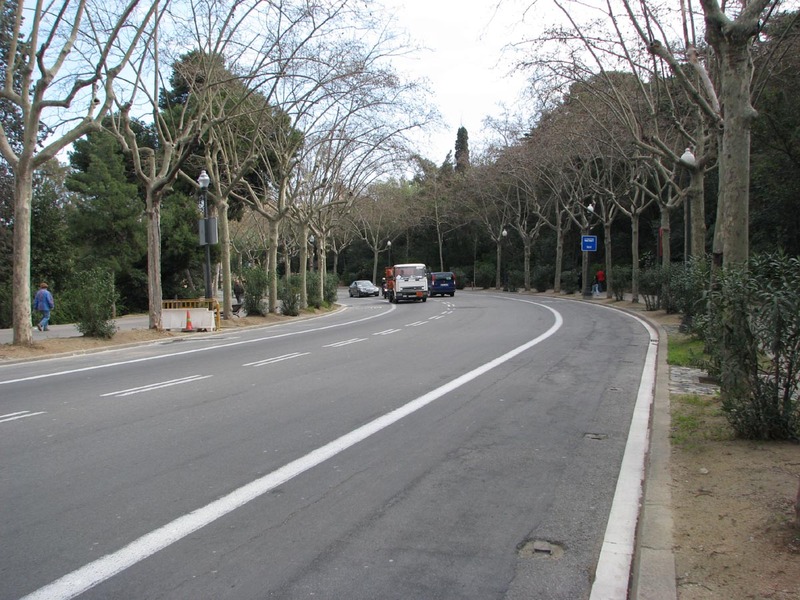 Indeed, a few years after the first Monaco GP in 1929 Barcelona revived the Penya Rhin Grand Prix which had been run between 1921 and ’23 at Villafranca. Instead of moving the event to the Sitges-Terramar oval which had been largely abandoned after the 1923 Spanish GP was held there, the Catalans created a new street circuit in the Barcelona city park of Montjuich, having had practice in 1932 with a race running over a course that had its start-and-finish line in Montjuich Park. The first Penya Rhin GP staged at Montjuich, run on 25 June 1933, was won by Chilean Juan Zanelli and his Alfa Monza, in a race of attrition that saw Wimille and Nuvolari run into trouble. In the three years following, during the seasons of the 750kg formula, the event produced three separate winners of name, Varzi in 1934, Fagioli in 1935, and Nuvolari in 1936. The German teams didn’t enter the 1934 race which turned into a straight duel between the fierce Nuvolari, racing for Maserati, and the elegant Varzi, who led a trio of Ferrari-entered Tipo Bs. 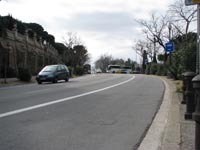 With the former’s leg only just recovered he had to give up the fight to Varzi, having led from the startline, before retiring with engine problems. 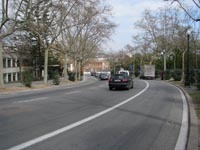 This left the road clear for a dominant Ferrari one-two-three, Varzi ahead of Chiron and Lehoux. 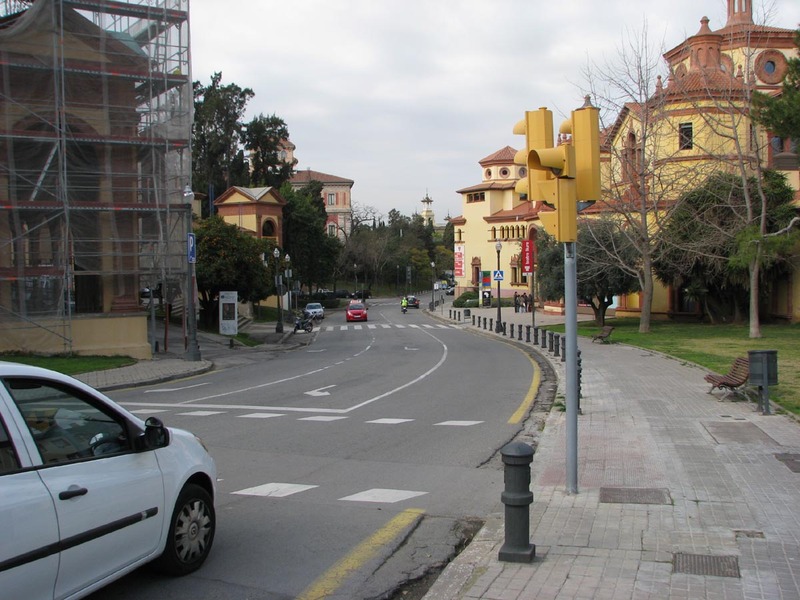 The Germans did go to Spain a year later – that is, Mercedes-Benz showed up with a pair of W25Bs for Fagioli and Caracciola while Auto Union stayed home nursing their unwilling new 5.6-litre engines, hoping to cure their carburettor problems in time for the German GP. In the race, the Mercedes cars duly cleaned up, the Abruzzi Robber finishing 47s ahead of Caracciola, with Nuvolari the only other driver to stay on the same lap. The 1936 edition of the Penya Rhin GP was the last before the Civil War put an end to sporting competition in Spain. 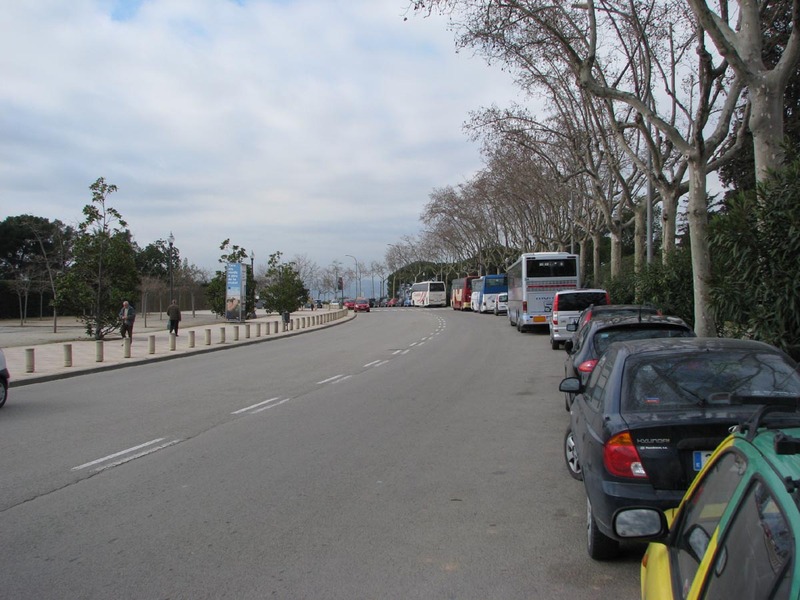 Now, both Mercedes and Auto Union put up camp in the Montjuich paddock, with Chiron and Caracciola in a W25K each, and Rosemeyer and Varzi being entered in C-types. Varzi, however, got into a row with the Auto Union management after Rosemeyer demanded Varzi’s long-wheelbase car for the race, having hurt his knee in a practice accident while driving the short-wheelbase ‘Montjuich special’. 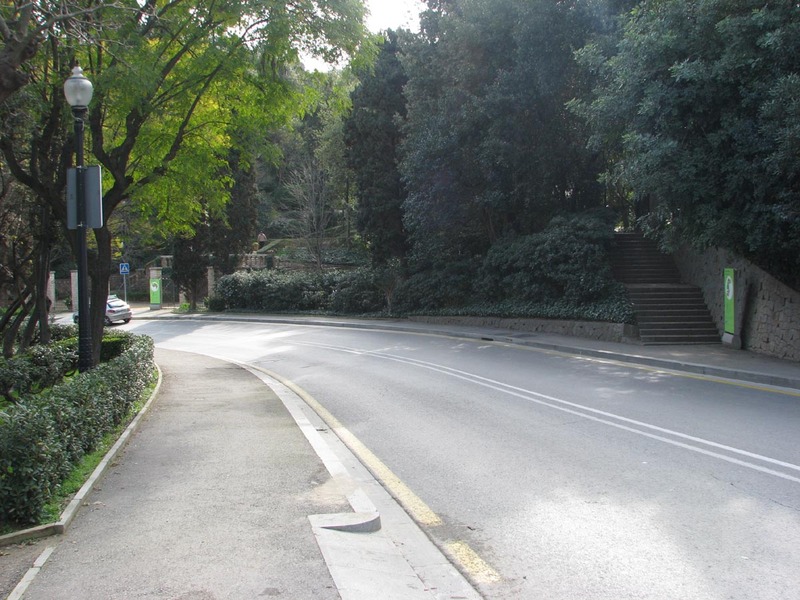 This had been built on Varzi’s own instigation but he didn’t like it when he first practised it. So he plainly refused to race it after having been asked to hand the roomier long-wheelbase car back to Rosemeyer. This allowed junior driver Ernst von Delius to make his GP debut. Meanwhile, Mercedes had created a short-wheelbase version of its own, and this showed handling problems similar to the Auto Union SWB car, creating the perfect conditions for a giant-killing performance that only Tazio Nuvolari would be able to pull off. And he would. While in 1934 his newly heeled leg had still kept him from winning the race, he had no such trouble from the broken ribs suffered at the Tripoli GP earlier in the year. With the other German cars all running into trouble, Caracciola’s Mercedes was only Silver Arrow left to challenge Nuvolari’s 12-cylinder Alfa which couldn’t even be stopped by an additional pitstop for fresh tyres and beat the W25K by 3.4s across the line. 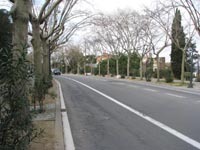 Post-war the Penya Rhin race was moved to the nearby Pedralbes track, another street circuit in the western suburbs of the city. 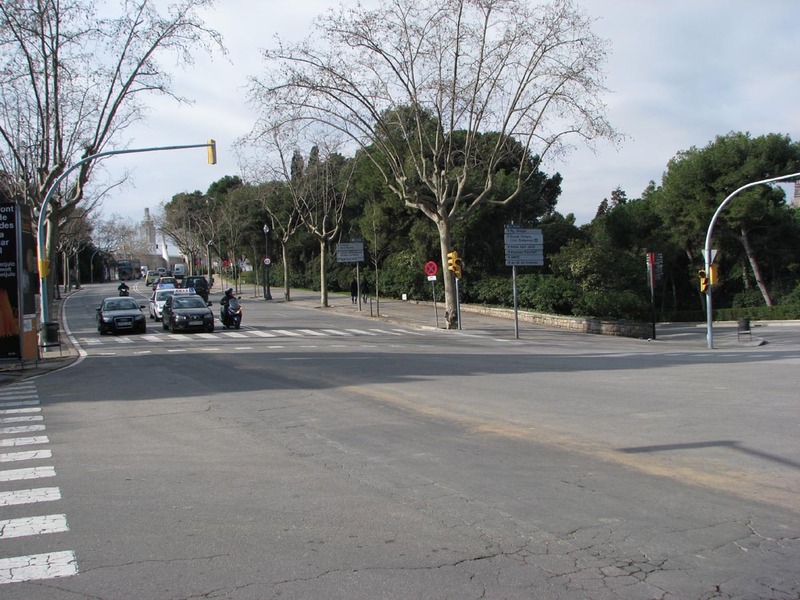 Pedralbes hosted two Spanish GPs, in 1951 and ’54, but the Le Mans disaster in 1955 put an end to the pedestrian-lined track. Grand Prix racing didn’t return to Spain until 1968 when the Spanish GP was staged at the newly opened permanent race course at Jarama. 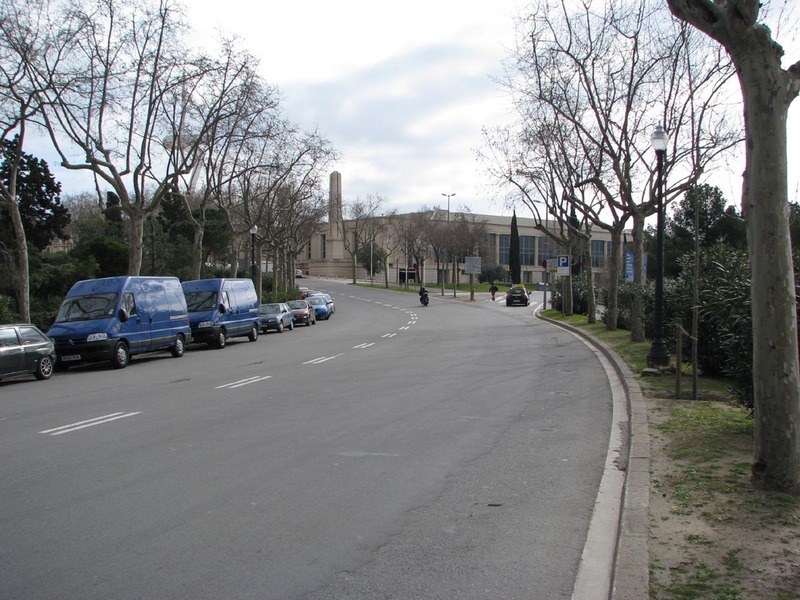 A year later, however, the race took place at Montjuich Park, the site of the former Penya Rhin GP. 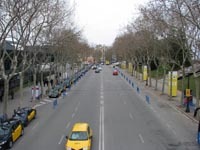 It was a result of the fierce intra-regional competition in Spain, with the Catalans trying their hardest to match whatever the nation’s capital came up with, forcing the Spanish federation to alternate between the Barcelona and Madrid venues. There was immediate drama in the first race when the aerofoils on Jochen Rindt and Graham Hill’s Lotus 49s both failed – on exactly the same spot. 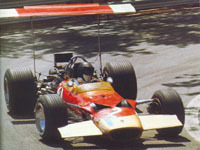 Rindt’s accident, crashing out of a safe lead into his team mate’s stricken car, cost him his season as he was left with serious face and leg injuries, leaving him sidelined while Hill won his fifth Monaco GP. The two violent crashes caused the CSI to ban the high wings forthwith. 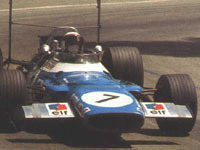 Meanwhile, Jackie Stewart produced a performance of dominance – on paper, at least – unseen until the 1995 Australian GP by finishing a whole two laps ahead of runner-up Bruce McLaren, but only after the luckless Chris Amon had to give up a commanding position in the lead yet again while his only remaining pursuer Jacky Ickx went out with five laps to go, a broken wishbone the reason for his retirement after he’d pitted before to have his rear wing replaced. 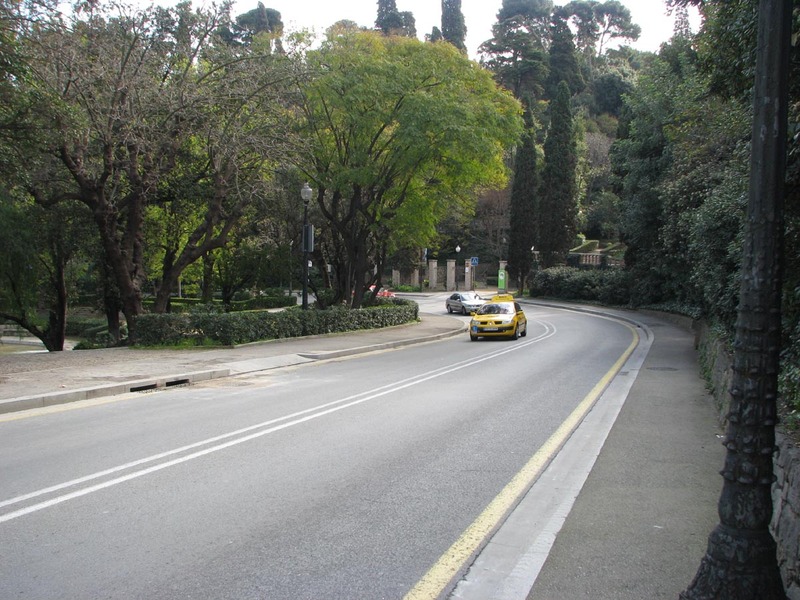 In the end, only five cars finished what had been a 12-car race, a low point in the World Championship history. Jochen Rindt before his violent crash into his team mate's stricken car. Rindt wasn't the only one to run into aerofoil trouble. Ickx was another victim. 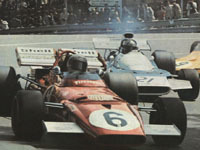 The 1971 race went to Stewart again, but this time the gap was somewhat closer, as he beat Jacky Ickx’s Ferrari by 3.4s – the same margin with which Nuvolari won ahead of Caracciola in 1936, incidentally. 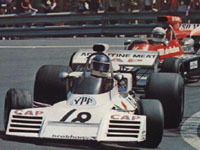 Using the brand-new Tyrrell 003, JYS broke the dominance of the 12-cylinders which had so far won the South African GP (Andretti, Ferrari) and the three non-championship events in between: Regazzoni (Ferrari) at the Race of Champions, Andretti again at the peculiar Formula 1-vs-Formula A oval race called Questor GP, and Rodriguez (BRM) at the International Trophy. After practice the twelves looked likely to dominate again, with Ickx (Ferrari), Regazzoni and Amon (Matra) locking out the front-row. 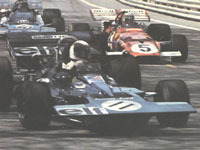 Stewart and Gethin were the only Cosworth interlopers between Rodriguez, Beltoise (Matra) and Andretti on rows two and three. On a blazingly hot Sunday the field blasted off to the first corner, Ickx leading, when El Angulo, the first-corner hairpin, already took its first toll, Hill’s Brabham being hit, causing his steering to become askew and forcing him into retirement five laps later. Meanwhile, Stewart had the bit between his teeth and passed Ickx on lap 6, having already overtaken Regazzoni. Mid-race, the Scot began to eke out a lead to the Belgian, who in turn was gradually moving away from Amon, in third place after also having devoured Regazzoni early on in the race. The gap between Stewart and Ickx had increased to ten seconds by lap 43 but down to 4 seconds on lap 60. Nine laps later Jacky set fastest lap to get within 3 seconds of the Tyrrell. But Stewart managed to hold the gap for the remaining six laps to give 003 a debut victory, and himself a hattrick of Spanish GP victories. 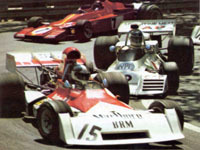 Stewart won again in 1971. 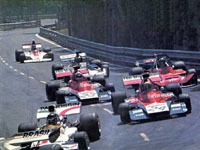 Here he is seen in the early stages, leading Regazzoni and Amon. Ickx ran Stewart close all the way but couldn't quite match the wee Scot. 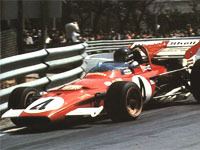 Regazzoni was forced to retire early in the race. 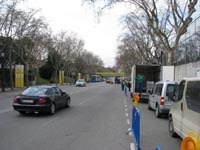 Here he enters El Angulo ahead of Beltoise and Hulme. 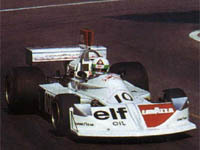 In 1973, Emerson Fittipaldi won ahead of François Cevert while in his single season of GP racing George Follmer scored his best finish by taking third place. 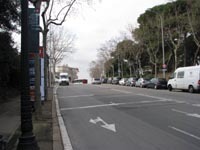 This was the race in which the new rules concerning the deformable stuctures had come into effect, while the event also saw the premiere of fixed starting numbers for the season. 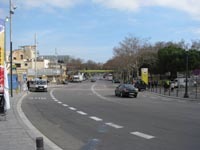 Practice had been all about Ronnie Peterson destroying the opposition with a string of pole-position laps, eventually ending up a whole 0.7 seconds quicker than the next-fastest man, Denny Hulme. 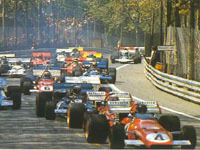 The 006s of Cevert and Stewart occupied the second row, the young Frenchman ahead of his team leader. As in 1971, race day was warm and sunny again, and during the morning the tens of thousands of race fans droned into the park to set themselves up for the start at noon. They saw Super Swede get off to a cracking start, leading Hulme, Stewart, Cevert, Beltoise, Lauda, Emerson Fittipaldi, Reutemann and Revson over the line after the first lap. After 20 laps, Peterson had built up a lead of around 6 seconds, but the Tyrrells were now second and third. Stewart had already overtaken Hulme, but now the Kiwi was heading into the pits to have an off-balance wheel cured. In fourth was Fittipaldi, having left behind a huge midfield scrap between Revson, Reutemann, the BRMs of Lauda and Beltoise, and a fast-closing George Follmer. The American Shadow driver had first overtaken Regazzoni, then moved past Ickx before reeling in and passing Beltoise, shortly followed by the Belgian, who was eager to get one back over Follmer. Meanwhile, François Cevert had suffered two punctures and dropped away from his third place to have both his right-side tyres replaced. Now, Peterson was holding a commanding lead over Stewart, who in turn was well ahead of Fittipaldi, who had a big cushion over Revson and Reutemann. The only excitement came from Follmer and Ickx battling it our for sixth, but that also came to an end when the lone Ferrari, having just retaken the UOP Shadow, had to pit to have his braked bled. Ronnie was well and truly flying all race but was robbed when his gearbox gave in. Emmo picked up the pieces. Carlos Reutemann came close to victory but had his driveshaft cruelly fail on him. Ickx wasn’t the only one to suffer from brake problems. The stalemate changed when Stewart shot up an escape road on lap 47 before crawling back to the pits with failing front brakes. This left the JPS cars in first and second, but Peterson’s dominance was to come to a premature end as his gears went one after the other. Ronnie had to give up on lap 57, with only first gear left. His team mate was in trouble too, however, as a slowly deflating rear tyre kept him from doing anything against a fast-closing Reutemann. 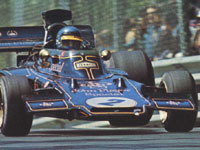 But amazingly, Emerson was scot-free again when the Brabham suffered a broken driveshaft only laps from the end. Now all the Brazilian had to do was nurse his car home, which he did with consummate skill, his deflating tyre almost flat when he crossed the line. 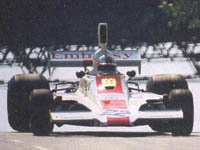 Cevert had fought his way back to second, while George Follmer was delighted to finish third in only his second World Championship participation. Furthermore, Fittipaldi’s rather fortunate win gave Lotus reason to celebrate its 50th World Championship victory. 1973 winner Emerson Fittipaldi wasn’t even part of the race in the last Spanish GP held at Montjuich Park. In this tragic and controversial event, the reigning World Champion led a driver revolt against the poor safety measures taken at the Catalan track. It all snowballed after a sponsor photoshoot out on the circuit. Emmo was requested by the photographer to sit down on the Armco lining the track, but the scandalous result was that the structure caved in under the Brazilian’s weight! 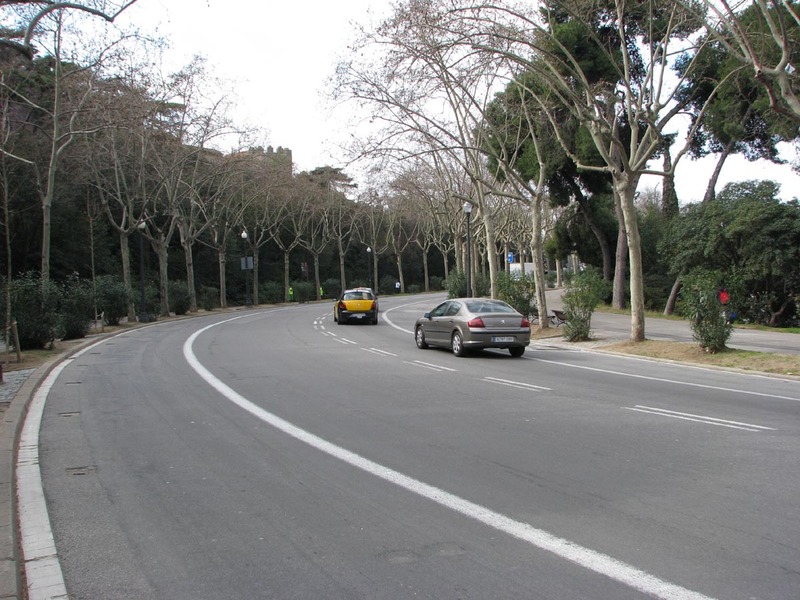 A quick inspection at other places around the circuit revealed that the Armco there was similarly useless in case of an accident. Fittipaldi wasted no time rounding up the leading lights of the grid at the time, such as Niki Lauda, Jody Scheckter, Carlos Pace, Carlos Reutemann and Denny Hulme as the president of the Grand Prix Drivers Association. 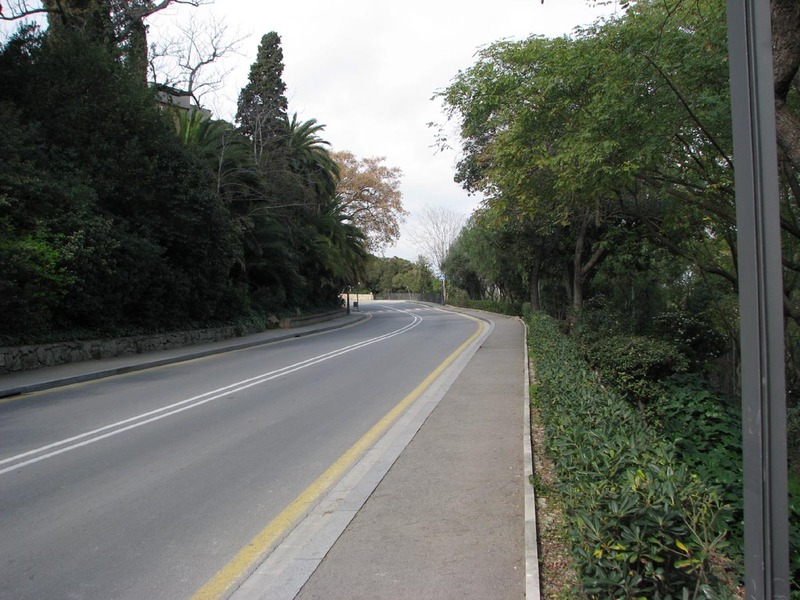 It soon boiled down to an ultimatum by Hulme to the organisers: fix the Armco or we won’t race. On Friday, first practice was duly cancelled but in the afternoon almost every driver except Ickx and Brambilla respected the GPDA boycott. 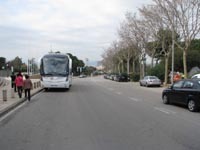 On Saturday, however, the pressure put on the drivers by their team bosses became too heavy. In the morning, rookies Wunderink and Evans joined the ‘defectors’ while Andretti, Donohue, Peterson and Brise joined them in the driver vote on whether to race or not. 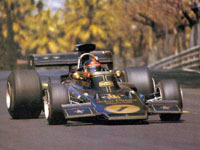 On Sunday Fittipaldi remained the only driver to stick to his guns. Rolf Stommelen when his rear wing was still intact. 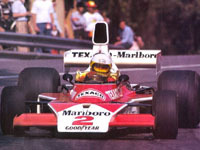 Jochen Mass was credited with the win. Lella Lombardi famously grabbed the final half point. A couple of hours he proved to have been the only sane man in the paddock. 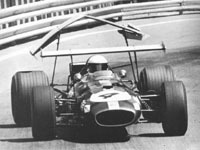 On lap 26, the rear wing of Rolf Stommelen’s leading Hill GH1 broke off on Rasente, the fast downhill section towards El Angulo. The car leapt up in the air, crashed into the Armco, which snapped immediately, and landed in the spectator area behind it, close to El Angulo itself. 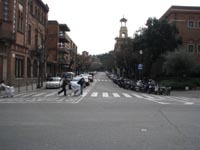 Five people were killed. 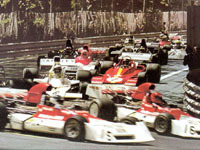 Three laps later the race was stopped with Jochen Mass declared the winner. In sixth place at that time – Italian lady Lella Lombardi, who remains the only woman to have scored World Championship points. Or half a point actually. Since the race had run to less than 66% of the intended distance half points were awarded. 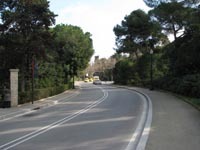 A visit to the grounds today gives a huge insight into the dangers the drivers – and riders – had to face when circumnavigating Montjuich Park. The pictures made by photographer Ron Verwey make that abundantly clear. 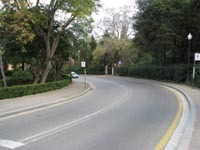 The track’s straight isn’t in fact straight at all but curves, falls and rises as it goes up towards the stadium kink, which comes right after the start-and-finish line. Looking towards the start-and-finish line from the back of the grid, with the stadium looming in the background. 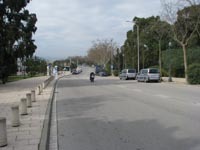 On the old start-and-finish line, with the stadium on the right. 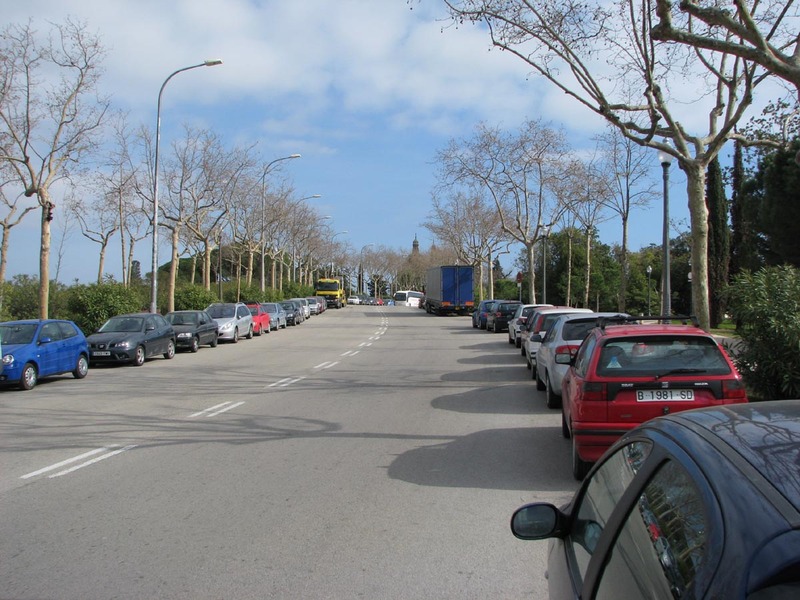 The cars raced past the stadium onto a section called Rasente that drops down quickly towards the first real corner, El Angulo de Miramar. In the eighties, when the venue still hosted a 24-hour bike race, a chicane was inserted here. It was a right-left-right chicane made out of strawbales, set up directly at the top of the hill, right after the Stadium and just before Rasente, where the cars used to go airborne - and the bikes still did. 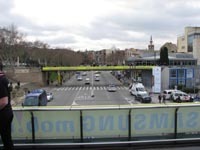 It used room made avalaible by stadium crossroad. The reason was to reduce the bikes flying at the top and avoid the risk of collision with slower riders, since the steep fall after the jump caused a momentary blind spot for the riders. Looking back towards the start-and-finish line from the top of the stadium hill. In front of the Olympic stadium. The stadium seen from a bit further down the track. Looking on towards the Rasente jump. The small straight after the jump running down towards the first corner. 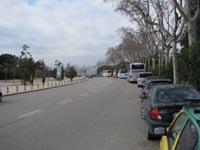 The final bit of Rasente seen from the outside of El Angulo de Miramar. 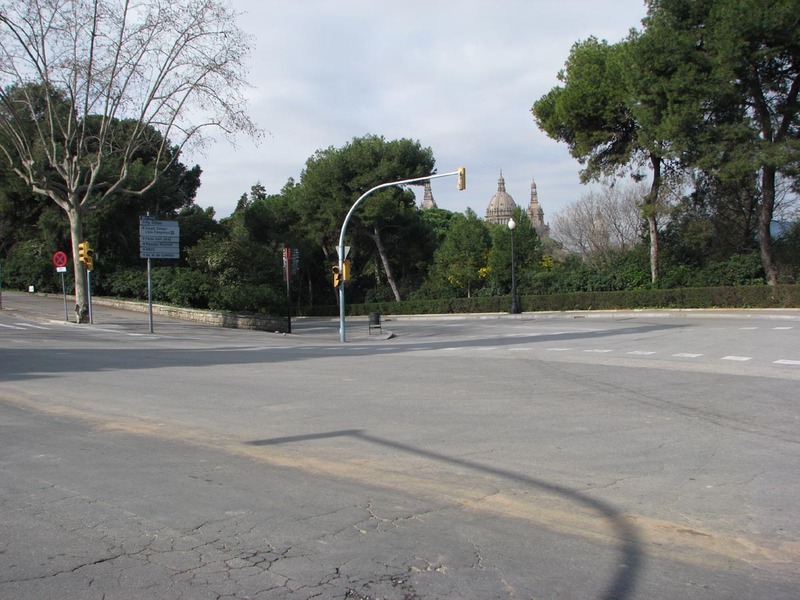 El Angulo de Miramar is a hairpin corner that must have been quite a cramped experience on the opening run after the start. 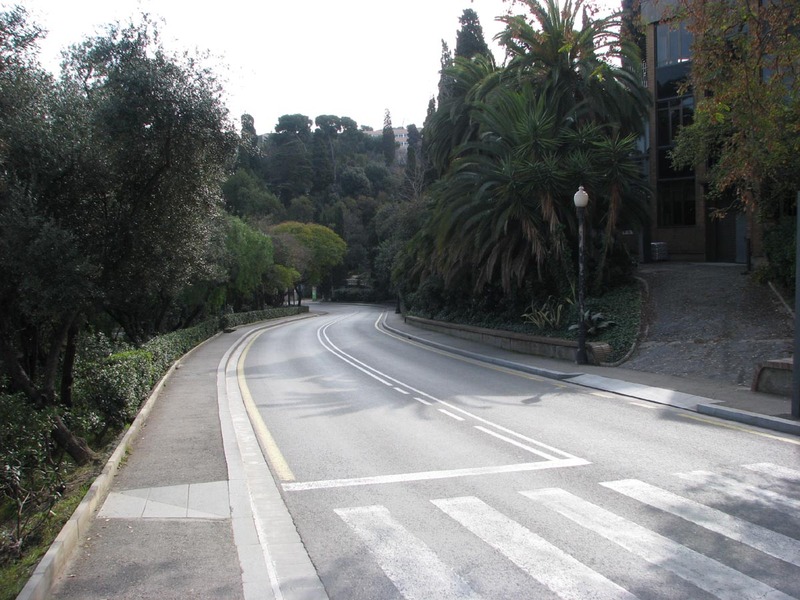 Unlike the Loews hairpin at Monaco, however, it does offer the continuing Avinguda de Miramar as an escape road. Today, it's a very busy intersection at the entrance to the park. 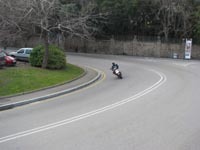 Closing up to the hairpin. 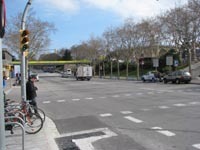 The entry to the corner seen from across the Avinguda de Miramar. 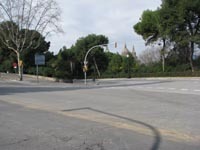 The exit of the hairpin leading towards Rosaleda. 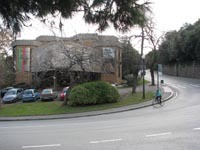 The apex seen from the southside of the avenue. 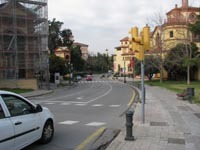 The entry to the corner again, now seen from the south. 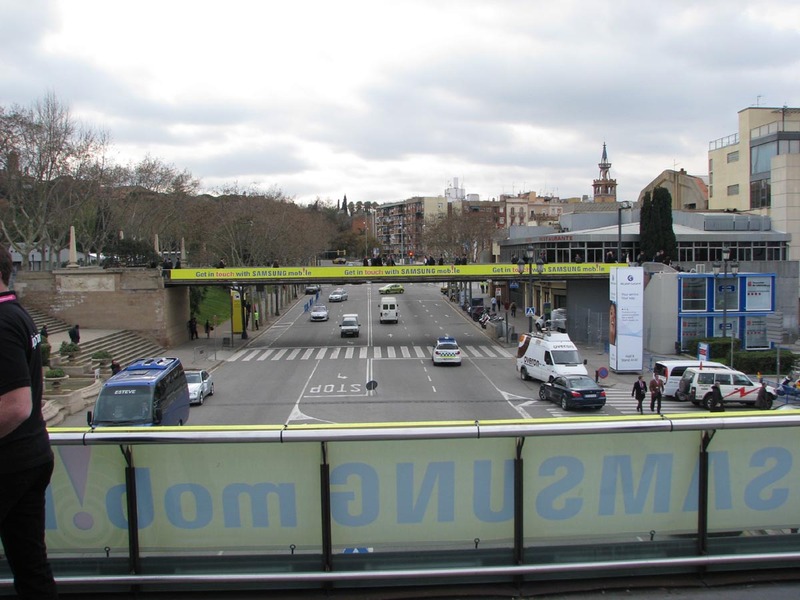 Looking to the plunge towards Rosaleda. 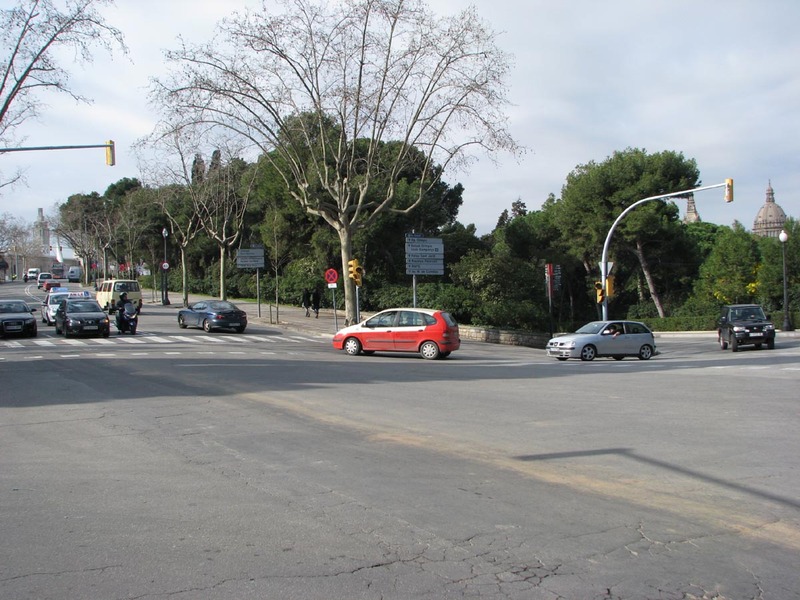 Right after El Angulo the track curves to the right onto a small straight towards Rosaleda, another 180-degree corner, although quite a bit wider than El Angulo. 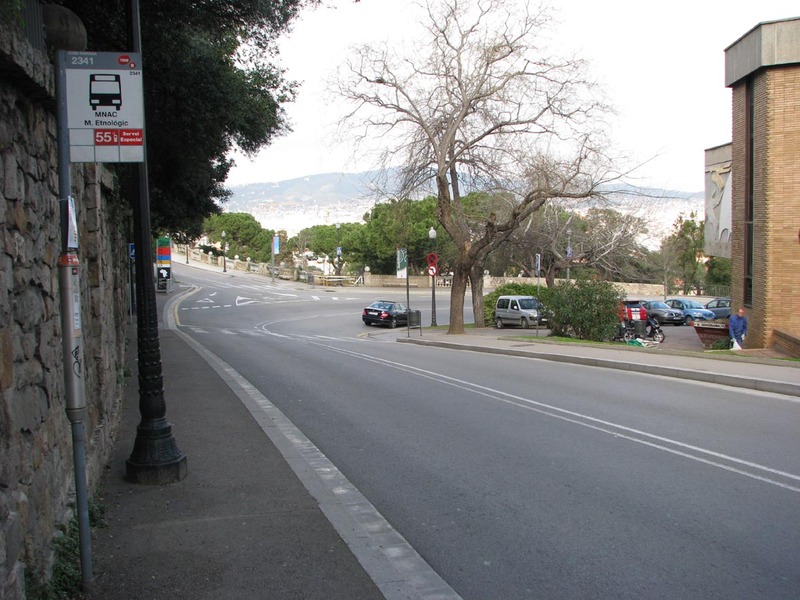 There is a wonderful view of the city from the outside of this corner. Moving on to Font del Gat, the road still continues to drop. The kink towards the straight to Rosaleda. 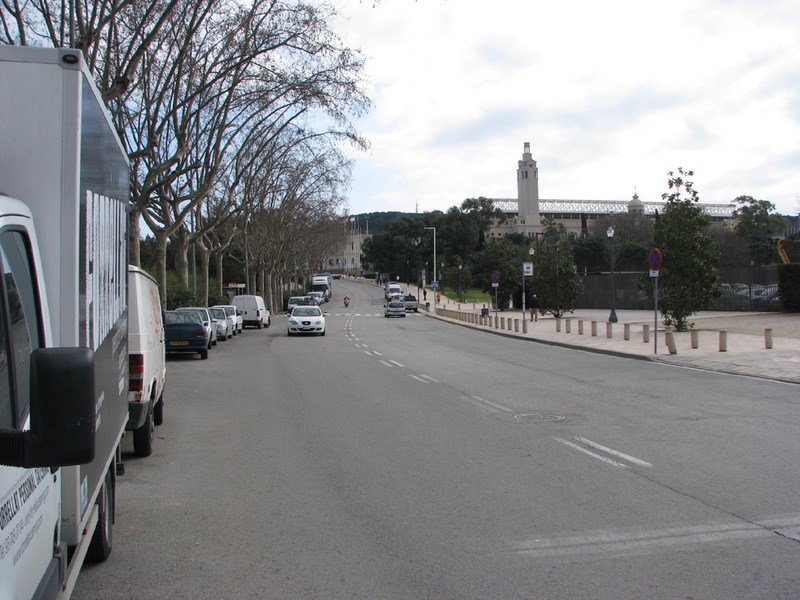 On our way to the next corner. Looking over the city standing at the entry. 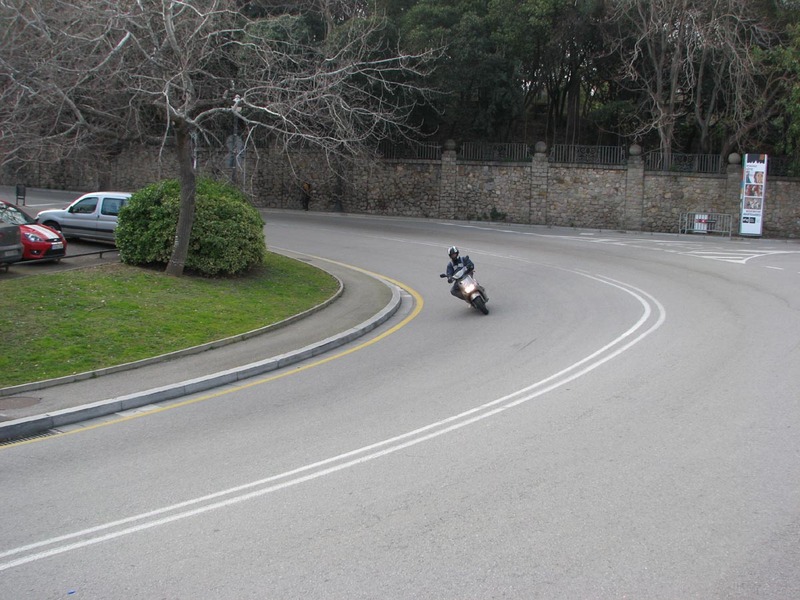 A lonely biker takes the curve. 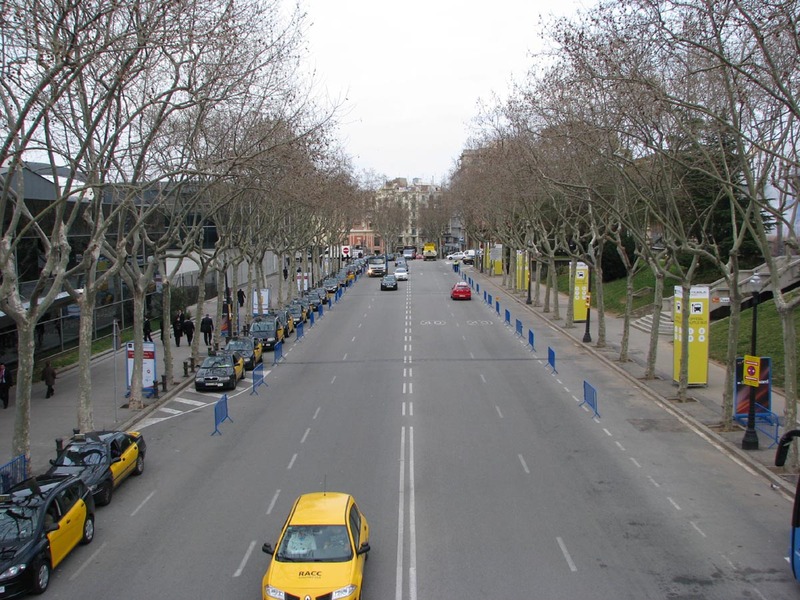 Standing on the exit overlooking the Passeig de Santa Madrona and the eponymous church. 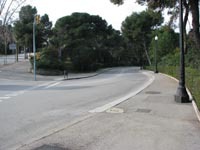 Going even lower, the way down to Font del Gat. The next few corners are equally photogenic. 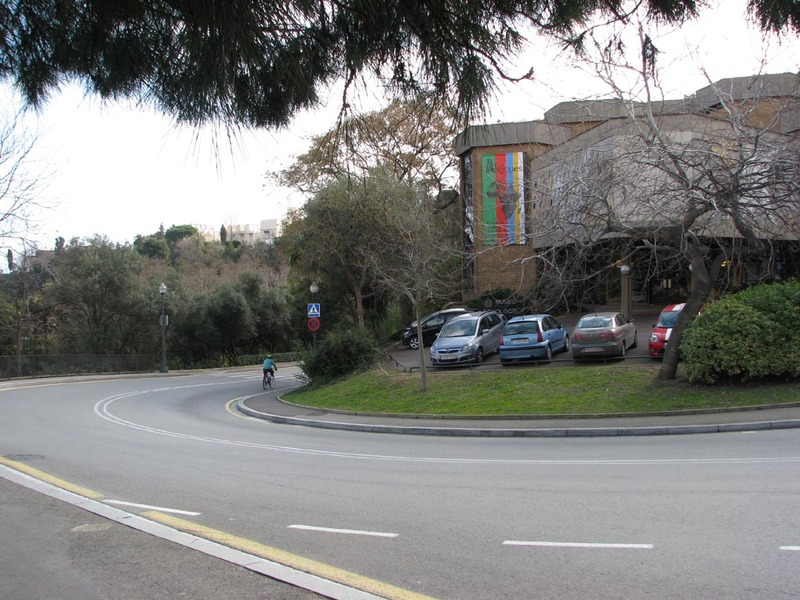 First comes the Font del Gat lefthander, which is followed by Teatro Griego, with its distinctive ocre-and-terracotta greek theatre in the background, where the track hooks left again, continuing on the Passeig de Santa Madrona instead of leaving the Montjuich area on the Passeig dell'Exposicio. 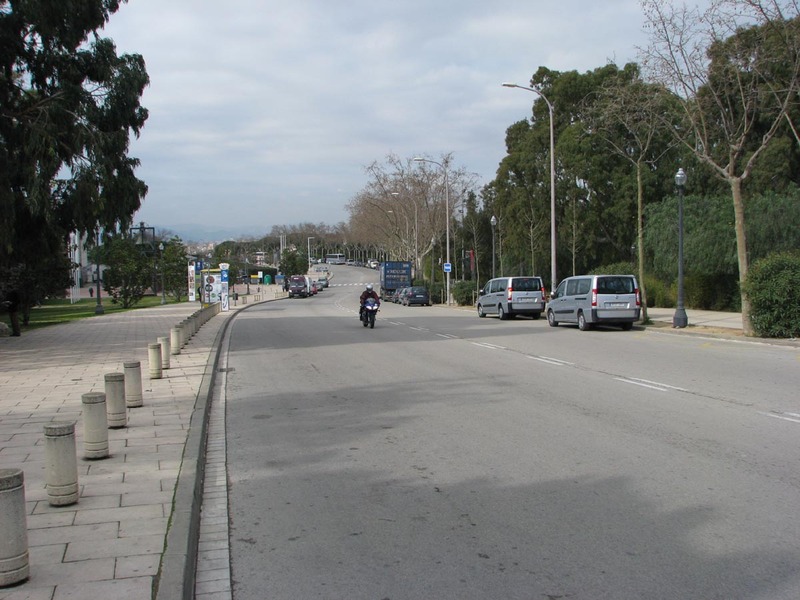 Looking back to Rosaleda, having almost reached Font del Gat. 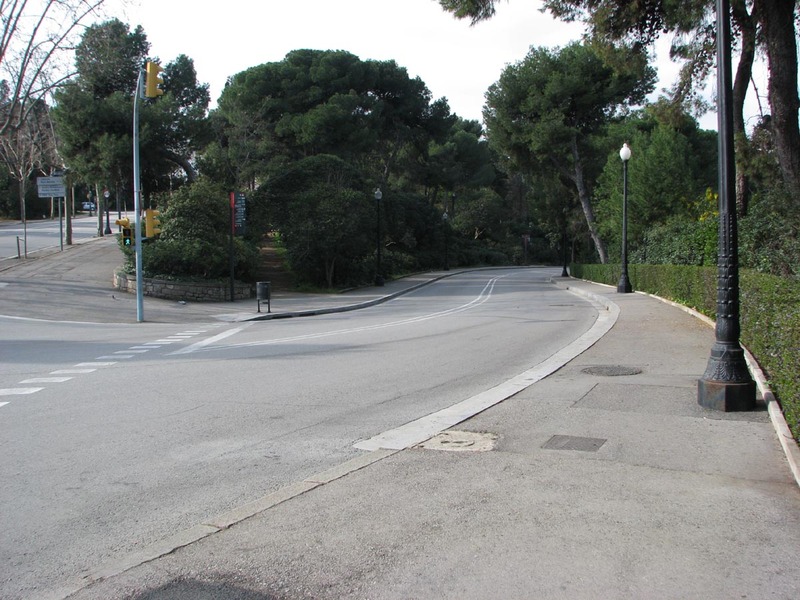 A look at the entry of Font del Gat from the inside of the corner. 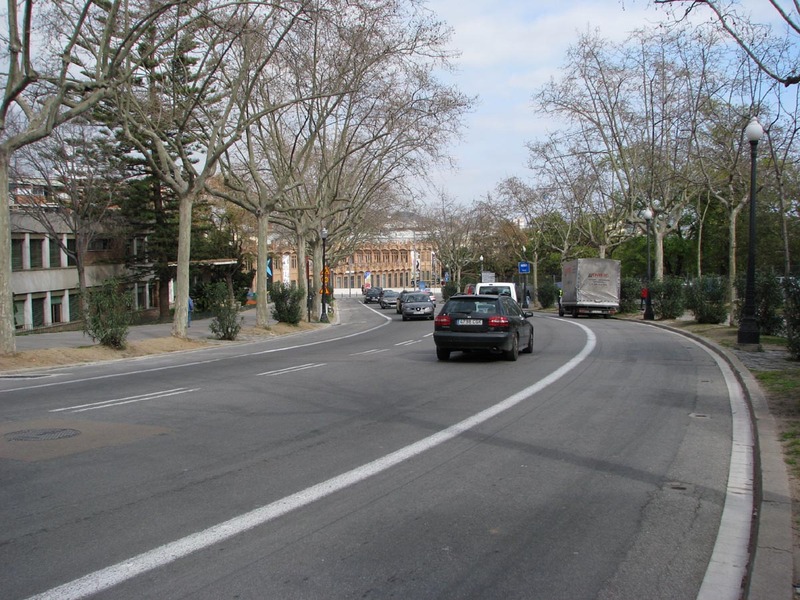 Coming from Font del Gat. The pretty edifice on the edge of the track. 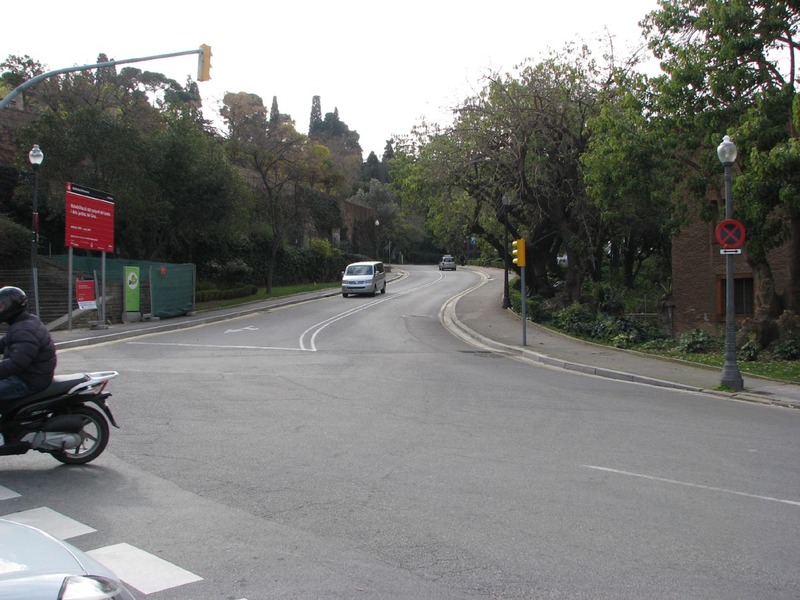 After an easy right-hand kink called Vias we enter an arrow-straight road to a 90-degree corner called Guardia Urbana, presumably because of the vicinity of a local police station, to enter the Avinguda de Rius i Taulet. 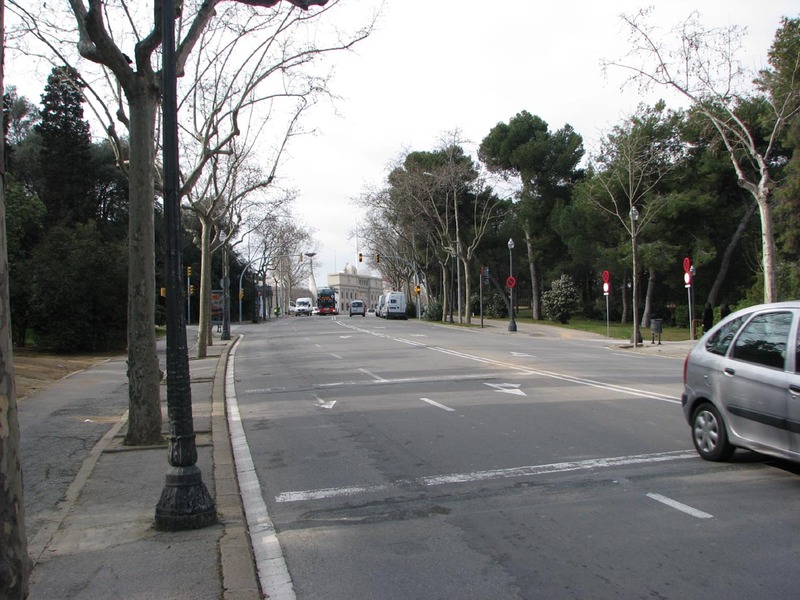 This is the only corner typical of a US street circuit. 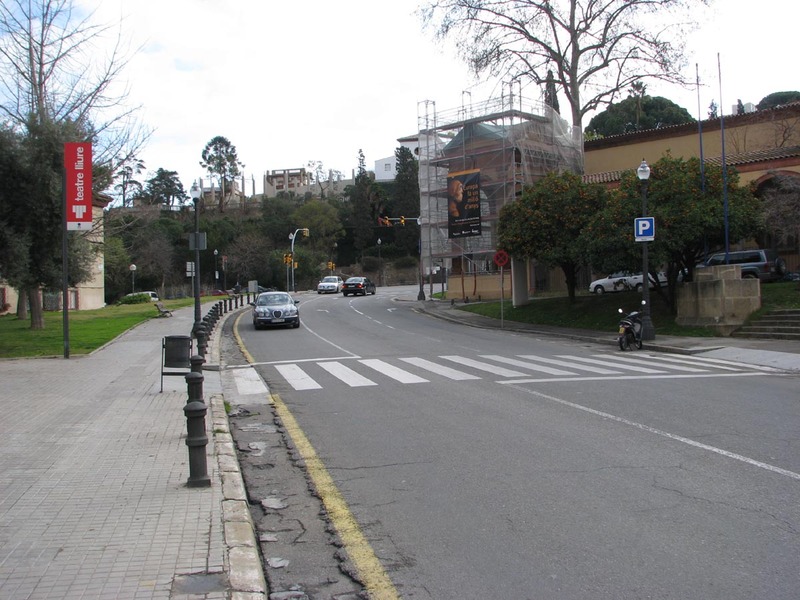 It's the start of another straight named the Recta de la Fuentes. 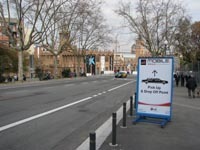 Here, we also pass the conference centre that today hosts several technology fairs a year. ...onto the next. 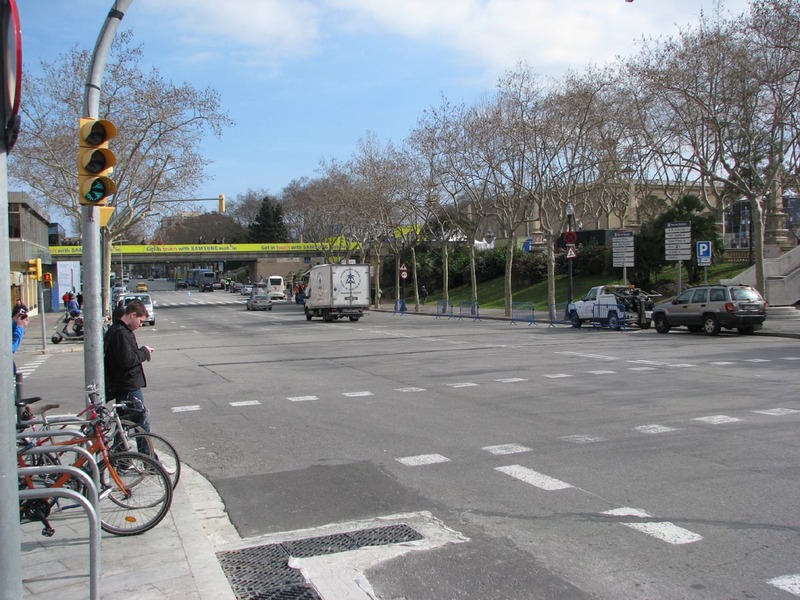 In the back we see the overhead pedestrian crossing towards the conference centre. 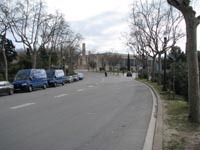 ...and this is what we see in the direction of La Pérgola. 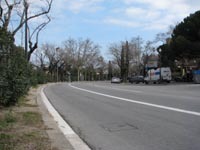 A view from the side of the road. 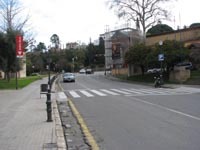 We are leaving the straight parts through the corner of La Pérgola. 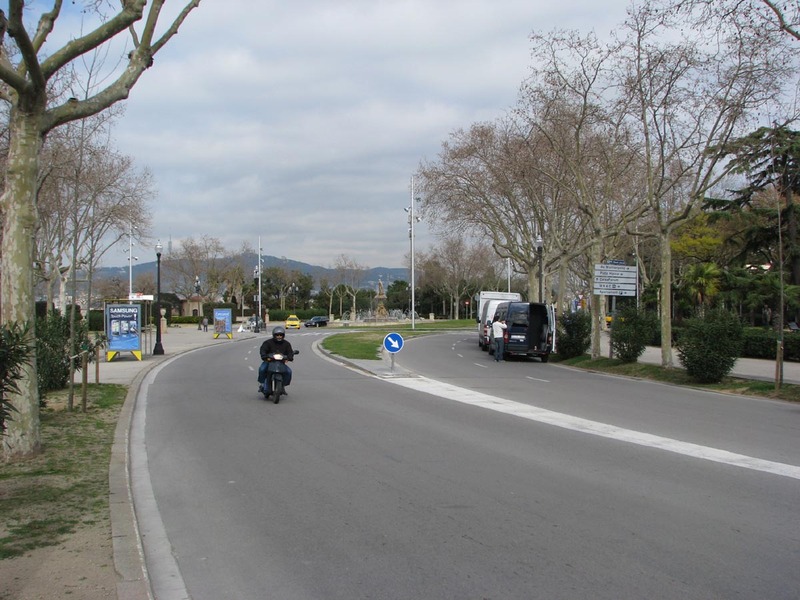 This is where the motorcycle races once had their start-and-finish line. 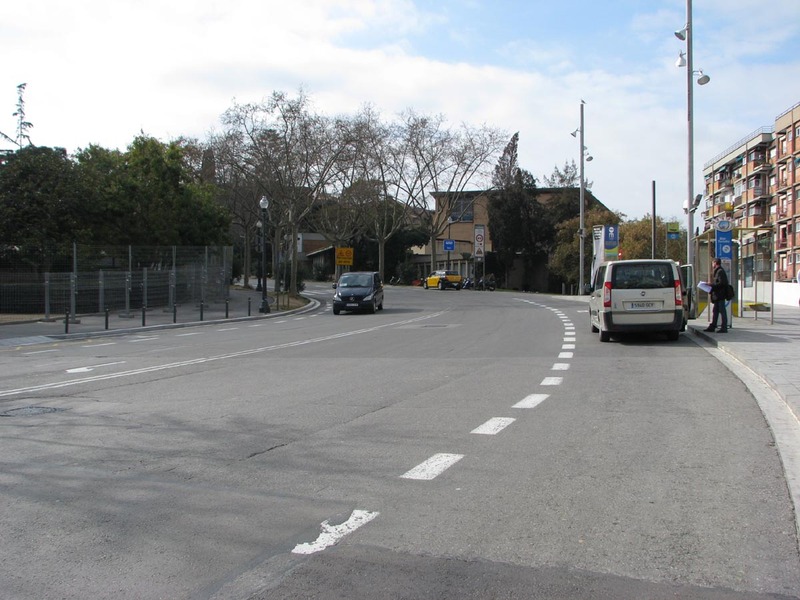 The spot where the motorcycle Grands Prix had their start-and-finish line. 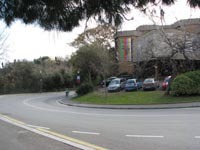 Looking back to the conference centre. 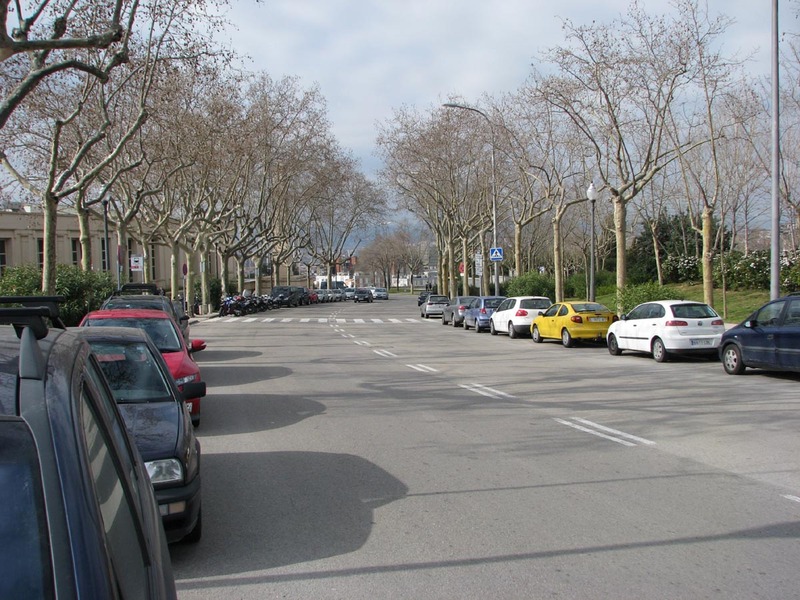 A sweeping lefthander towards Pueblo Español. After La Pérgola comes another sweeping corner called Contra Pérgola (obviously), now curling to the right onto a short semi-straight named Pueblo Español, until the track starts its almost ever-lasting left-turning sweep towards Sant Jordi and back to the main straight. 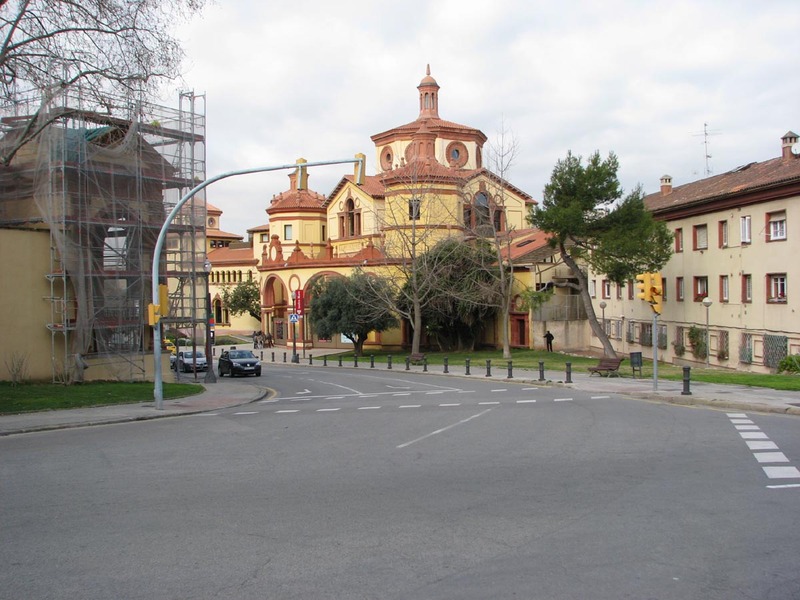 Here, the road starts to climb again. 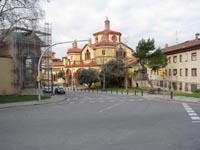 Out of the La Pérgola lefthander into the Contra Pérgola righthander towards Pueblo Español. 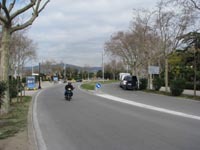 The entry to the righthander leading onto Pueblo Español. Looking back to Contra Pergola. 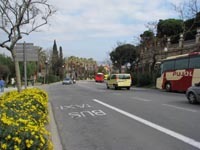 A look back to Pueblo Español from the outside of the long and winding lefthander towards Sant Jordi. 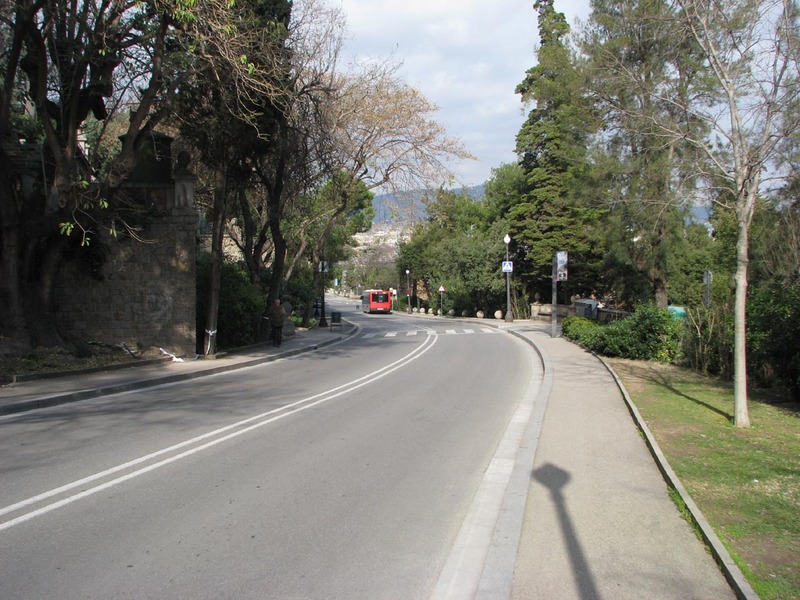 The road is starting to climb again. 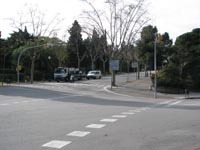 The circuit now takes the right side of the double carriageway named the Avinguda de l'Estadi, passes the square on which the Avinguda dels Montanyans exits, before rising further to Sant Jordi and onto the main straight, which is actually still following the circular shape that was started way back at Pueblo Español. 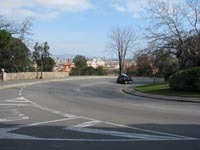 The track then plunges into the deep again as turns back to the right before the start-and-finish line hoves into view. 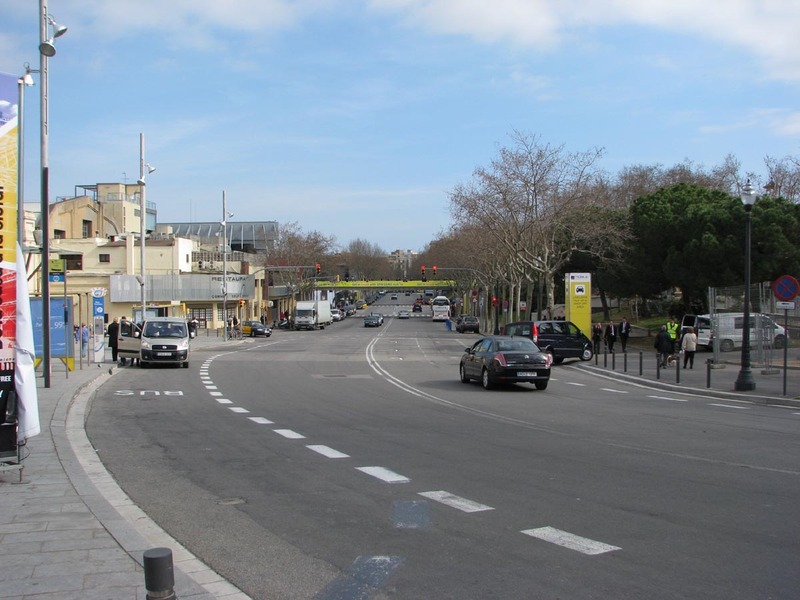 The square wasn't there when the circuit was still in use as a Grand Prix track, but it was used to create another chicane in the 24-hour days. It first appeared in 1982 as a right-left-right chicane, so on the other side of the square when compared with our track map, using strawbales again. 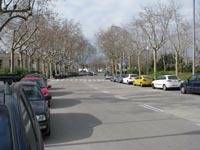 Approaching Sant Jordi having left behind Pueblo Español. Past the square, a more recent addition to the Avinguda de l'Estadi. 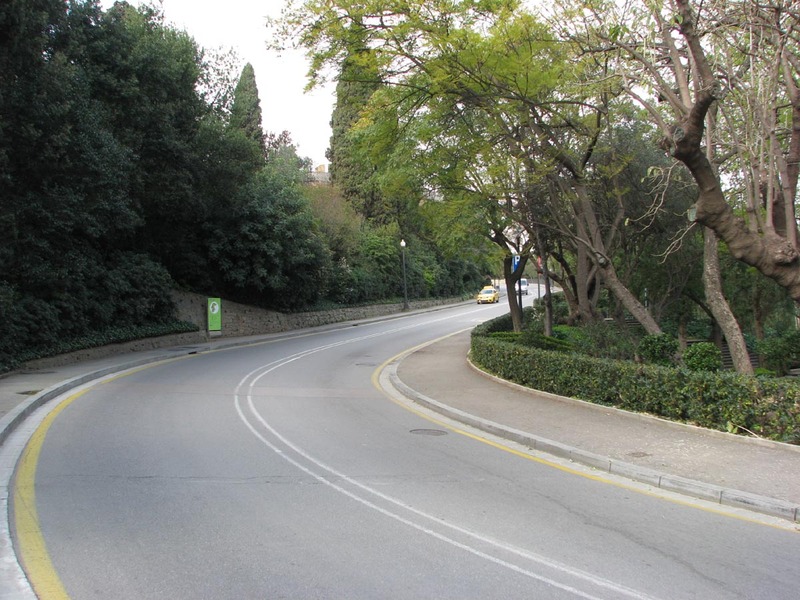 Into the corner, the road is sloping down again. 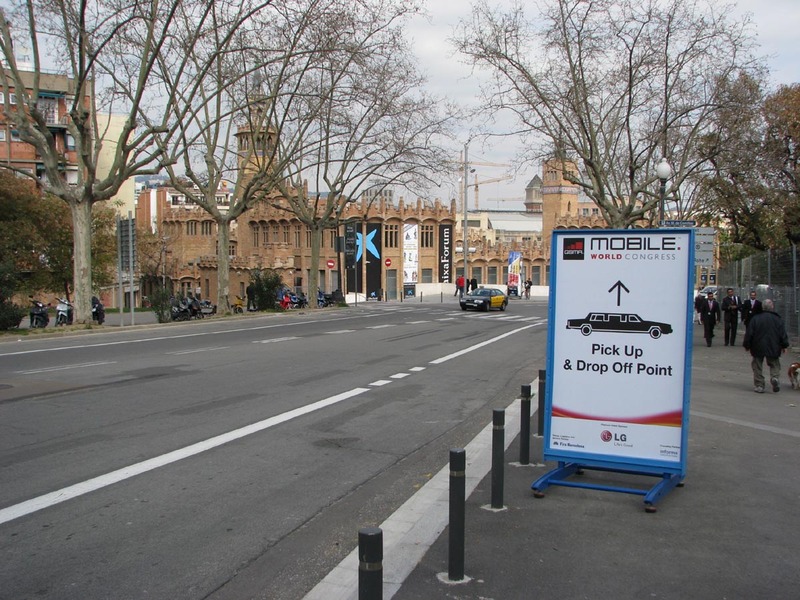 Looking back on the exit of Sant Jordi.